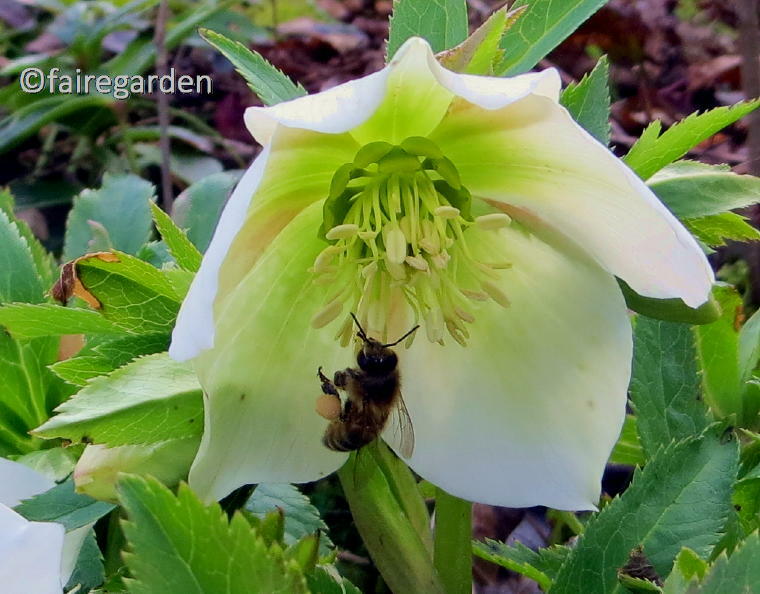 It was the first day of the year that these two, the bee and the hellebore were seen together. …And the grabbing of the camera. Above: Same photo as the previous one, uncropped. This very plant was featured in this photo, taken February 27, 2009 that was honored with an award, read the story here. As thrilling as that was, when my friend, the delightful and talented Lisa of Greenbow Gardens and her artistic side blog,Artsy Endeavors came here to the Fairegarden last May while traveling to the 2012 Fling in Asheville with Rose and Becky, she gifted me with her rendition of the 2009 bee and hellebore shot. Tears of gratitude fell as hugs were exchanged. This watercolor is displayed with pride on a shelf and brings a smile every single day. Thank you, Lisa. 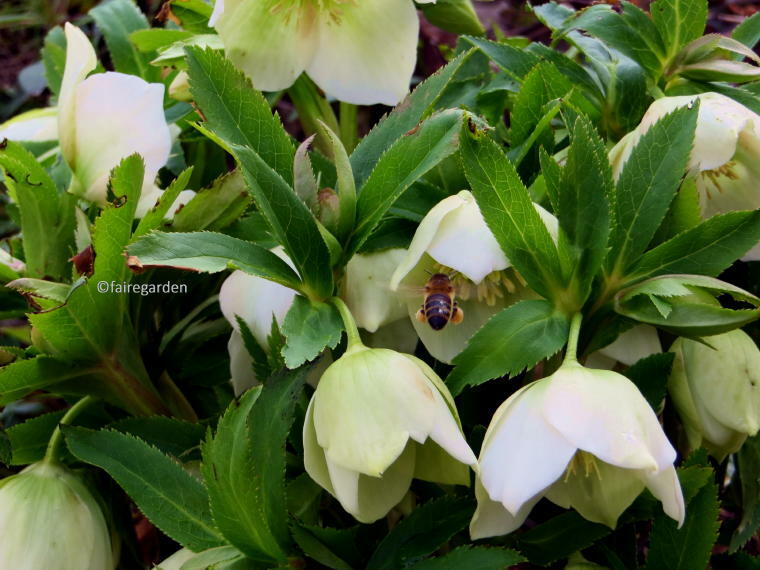 Your friendship is treasured, even as are the bees and the hellebores that make the winter garden sing with joy. This entry was posted in Photography, Seasonal Chores, wildlife. Bookmark the permalink. I am glad you enjoy the little painting I did for you Frances. I enjoy your blog every time you post too. My Hellebores are just beginning to bloom. It hasn’t been warm enough here to encourage bees out of hibernation. It won’t be long though. Have a great weekend. Thanks for the link love too. Dear Lisa, your little painting makes me so happy in so very many ways. Thank you for your friendship and loyal readership of the blog, too. You have been with me since the very beginning, a kind voice from the blogdom. I am so glad that we got to meet in person in Chicago and then reunite in my garden for Asheville! You too, have a wonderful weekend. 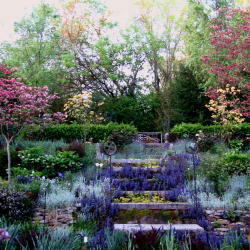 Beautiul photos and thoughts! You must have been overcome by that gorgeous watercolor painting!! Thanks, Karen. Overcome is the word to best describe the happy surprise when Lisa revealed her gift to me. It was totally unexpected since it had been three years since she had painted it from my photo. She said that she was waiting until she came to my garden in person to give it to me. That day came last May, I will never forget it! What have we here? charming bees diligently following their job descriptions….. heart stopping flowers unfurling their gifts of color, shape and texture like experienced geishas, ……skillful images by a gardening photographer /photographing gardener whose art begins with really “seeing”….. and graceful , delicate brushstrokes performing their own ballet to depict the dance of bee and fleur. Yet the most beautiful thing of all is the generous friendship between two lovely people whom nature has brought together . How sweet are your words, Marguerite, thank you so very much! 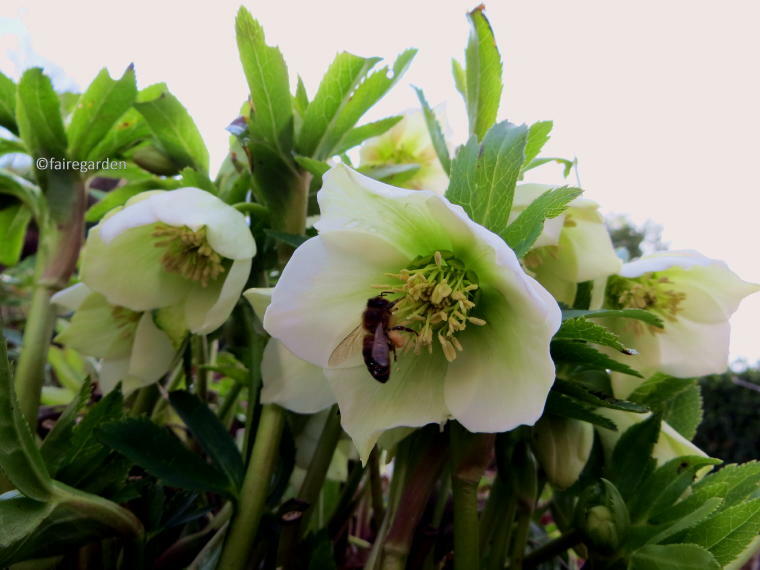 The bees visiting the hellebores is a yearly ritual here, a rite of spring to come. But nothing compares to the joy of friendship Lisa has given to me. Hi Gail, thanks. It was exciting and cheering to see those bees. 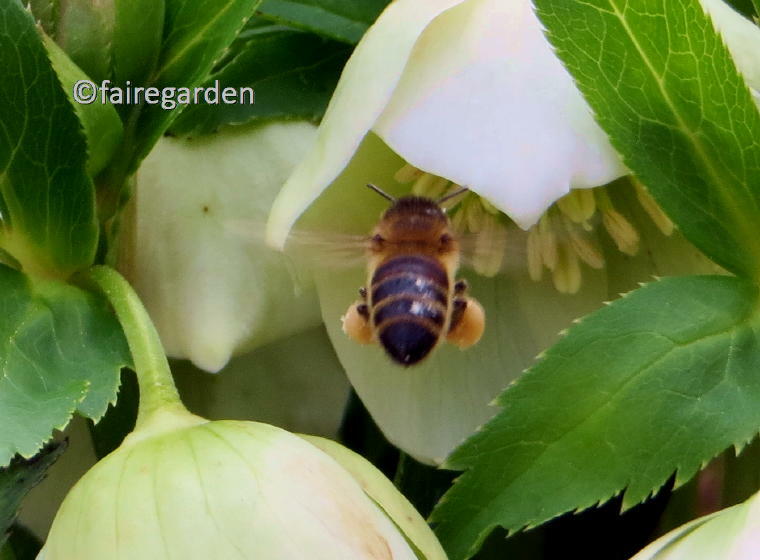 It has been so cold, then warmed a bit and the bees were suddenly all over the garden on the hellebores that are also all over the garden. If ever there was a good reason to grow hellebores! I think you have been given hellebore babies. The white ones seems to open first. Garden bloggers are indeed the bestest. Beautiful pictures! This little guy really must have been a “busy bee” by looking at all the pollen he’s collected! I love watercolor paintings of flowers and this one is exquisite! How lucky you are! Lisa is such a wonderfly gifted artist!! Hi Christy, thanks so much. We have a kajillion hellebores here, they have seeded all over the place. The bees have lots to keep them busy, thank goodness! Lisa is a wonderful artist and a dear friend. I am proud to know her. I was just thinking how fab your shot was. Lisa is some artist too. What a lovely gift. Hi Dee, thanks so much. Lisa is a jewel! Every time I read your blog it makes me race out to my own garden to see if mine possesses the same magic as yours.Your photographs accompanied by your amazing descriptions make me feel I’m right there with you and you’re talking to me only.Your blog makes my heart sing! 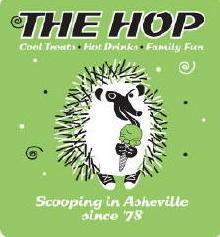 Your words are like milk and honey to my ears, Beth, I do so appreciate you! 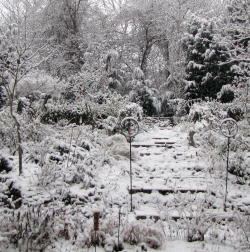 This blog was started to share my garden with others, through photos and text that describe what is going on here. 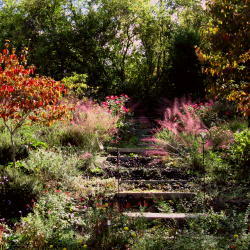 I know that you feel like you are here with me in the garden means so much. Thank you. Great photos but I just adore Lisa’s artwork. Come visit here please Lisa. Hi Layanee, thanks. I agree completely about Lisa’s talent. What a treasure she is, and the painting she so generously gave me. You know, that photo still continues to be one of my favorites from you. You can just tell that the eager little bee is just wanting to collect some of that wonderful pollen! And so early in the year, too. Your friend did a fantastic job with the watercolor, and I love how the edges are torn too! [I do that when I work with watercolors as well…] it makes the illustration as a whole more display-worthy! Love the simple display with glass too~ Lisa is very talented! Hi Donna, thanks so much for the kind words. Seeing the bees at this time of year was at first shocking but now expected. When I didn’t see them as the hellebores first opening I was worried. But they just needed the flowers to open all the way it seems. 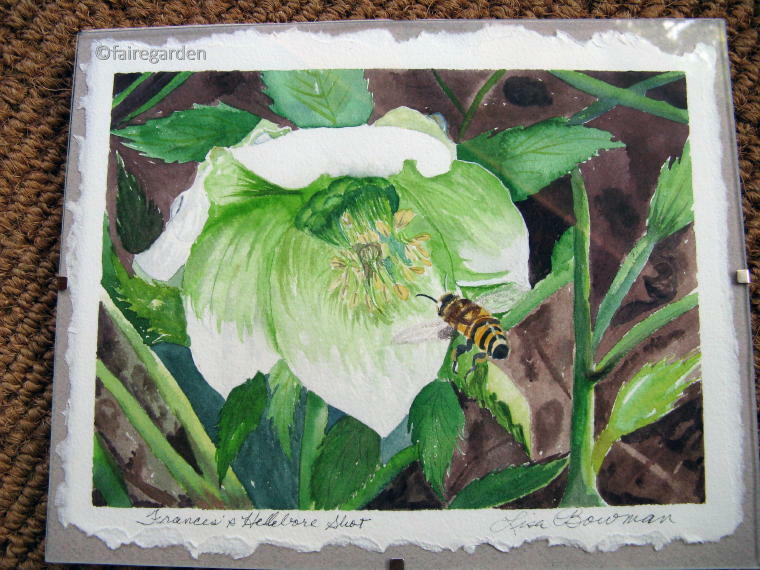 Lisa’s rendition of the bee and hellebore is something I will always treasure. Fantastic pictures – incredibly sharp. I love the closeup that lets you see the pollen on the bee’s legs. Thanks, Jason. I take many shots and hope that some or even just one are fairly sharp. Sometimes they are good enough. what a lovely gift and such a good painting. Hi Helen, thanks. It was a wonderful gift that I will always treasure. Bees are our friends…spoken from an old friend’s mouth. He LOVES honey. Hi Elizabeth, thanks for visiting. Bees are indeed our friends, in so many ways beyond the delicious honey. Hi Beth, thanks for visiting. Spring comes here in fits and starts, beginning as early as January sometimes and lasting until things heat up in mid-April. 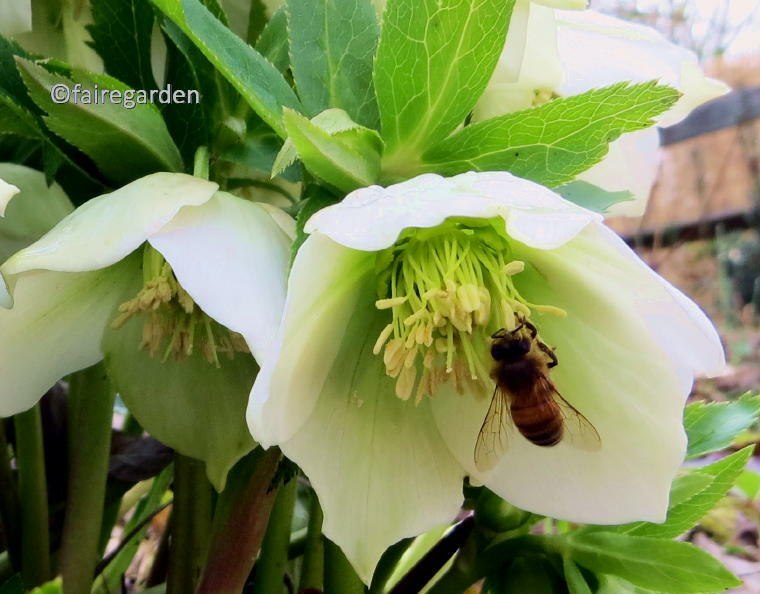 The hellebores and bees are among the best of those spring bits. The hellebore blooms will last into May, such a wonderful plant. Fantastic. What an honor. Loved the pics. Thanks Lola, it truly was an honor. I’m a lover of hellebores and that painting is lovely. I was surprised to see a hellebore blooming at the end of Jan here in my Ohio garden, but before I had time to get a photo it got snow covered again. But no bees yet!! Hi Pearl, thanks for sharing your story here. I am so glad you also have seen an early blooming hellebore. It does seem a miracle that flowers can bloom when it is so cold. It is also amazing when bees show up after temperatures have been in the 20s the day before, too.